Last Sunday (27 Nov.) the Knotty Pine Striug Band were part of the lineup in 'This world is not my home', an 'inspirational bluegrass gospel experience' in St Mary's church, Killyclogher, Co. Tyrone, presented by the Killyclogher & District Development Association. A three-minute video by John Hutchinson about the show can be seen on their Facebook. Ballymore Acoustic Gigs announce that their last show of 2016 will be on 9 Dec. at 8.00 p.m. 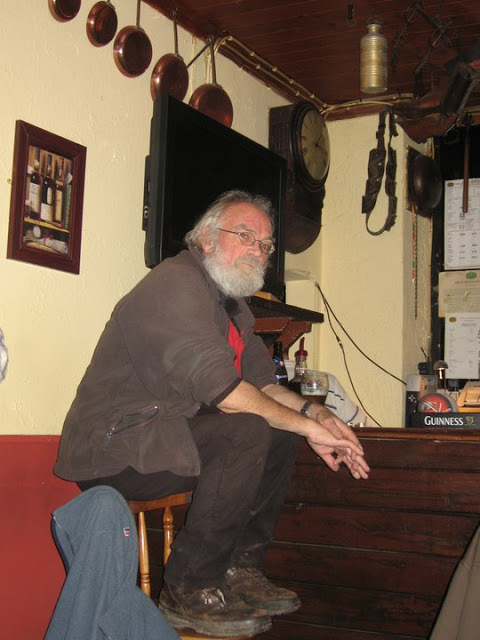 It will be the 6th Annual 'Vibe for Larry', commemorating the late, great Larry Roddy (photo by Mike Lindauer), a true pioneer of roots music promotion in Ireland, who founded the series of acoustic music gigs at Ballymore Eustace twenty-five years ago. US bluegrass acts who have played there more than once include the Special Consensus and Jim Hurst & Missy Raines. Erdini will be on the bill at the Bundoran Church of Ireland Christmas Charity Concert, featuring also the Eurovision-winning Charlie McGettigan and the 'incandescent' Bel Canto Choir, with actress Maura Logue of 'Ros na Rún' as MC. The concert will take place at Bundoran Church of Ireland, Co. Donegal (on the seafront, R267, just before the climb into central Bundoran), on Friday 2 Dec. at 8.00 p.m. The Whileaways will release their Christmas single 'Everyone' tomorrow (1 Dec.), following that with their Christmas special concert at Campbell's Tavern, Headford, Co. Galway, on 3 Dec. Tickets can be booked online. Greenshine will be on the bill at a benefit concert for the Cork Simon Community on Sat. 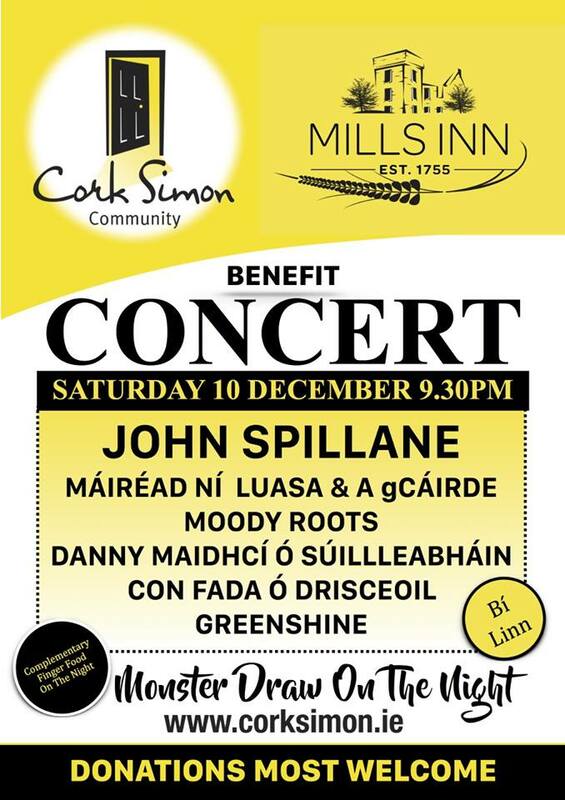 10 Dec. at the Mills Inn, Cork, starting at 9.30 p.m. More details are on the poster image (right). Pete Lamb, leader of Gone to Grass and former organiser of the Galway Americana Festival, is playing this coming month on Friday 2 Dec. at the Ardilaun Hotel, Galway, 8.00 p.m.; on Sat. 3 Dec. in Sexton's, Kinvara, Co. Galway, 10.00 p.m.; on Sat. 10 Dec. in Tully's, Kinvara, 9.00 p.m.; and on Sat. 17 Dec. back in Sexton's, 10.00 p.m. In most months of 2017 Pete will be playing in Power's of Oughterard, Co. Galway. The Henry Girls announce their last gig of 2016: their debut at the Pavilion Theatre, Dun Laoghaire, Co. Dublin, on Fri. 16 Dec. at 8.00 p.m.. 'We'll be previewing songs from our new album (due for release early 2017), revisiting a couple of songs from bespoke performances we gave in 2016, there'll be songs from our Sketches EP, and of course some festive numbers! Do join us!' Tickets (€20) are available online.